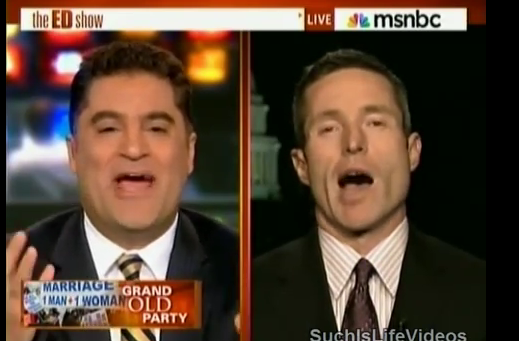 GOProud has gay blog readers scratching our heads this week (and any other time we dwell on them) after Christopher Barron jousted with Cenk Uygur on MSNBC, going so far as to claim Don’t Ask Don’t Tell’s repeal is a product of Republicans supporting gays more than their Democratic counterparts. We’re with Uygur on this one. The host begged Barron to “Wake up man. In 2004 they ran a whole national campaign against hating you.” Conservative sensibilities are one thing, but any self-respecting homo throwing their vote in with a political party that votes against us EVERY TIME is going to have a hard time convincing us that they are all that self-respecting after all.